A DateJust is a classic timepiece every woman should have in her wardrobe. The design isn’t just strikingly timeless, it’s practical and built to last a lifetime. At Bob’s, we’re also big fans of the two-tone look. This elevated design adds a dash of elegance to even a t-shirt and jeans, yet, it’s classy to wear on a date — it’s also sure to be a great conversation starter at the office. Today though, we’re highlighting an even more special Ladies Datejust, this 178343 with a mesmerizing olive green dial. Let’s have a closer look. 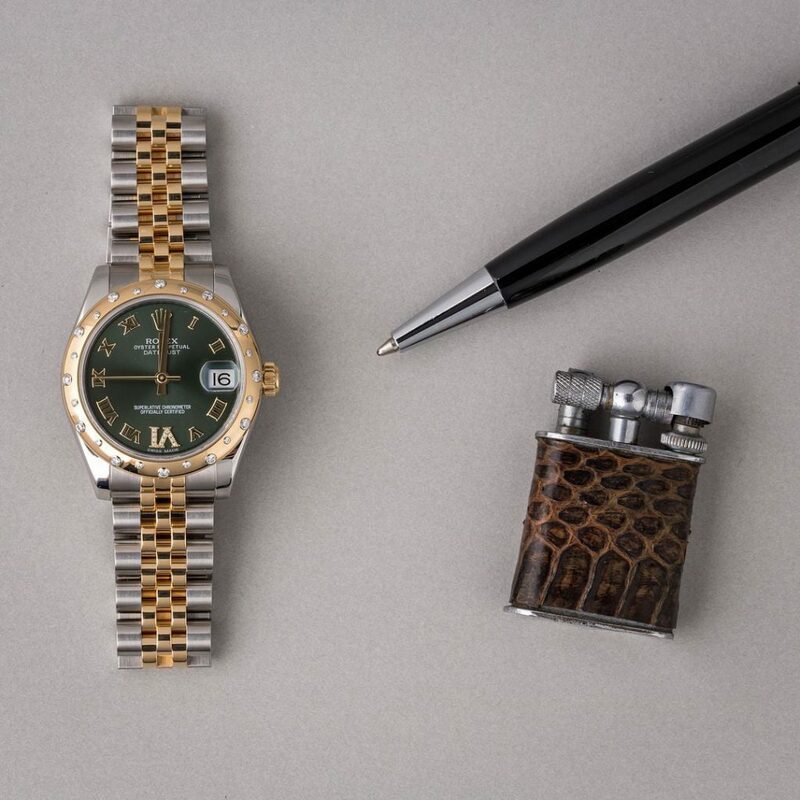 The first thing that draws you to this watch is that unique green dial — the olive color popping against that 18k gold and diamond-clad bezel. The roman numerals are also outfitted in gold, shimmering in any ray of light they catch. The signature cyclops lens at three o’clock is also highly visible, yet never seems to distract from this one of a kind dial. 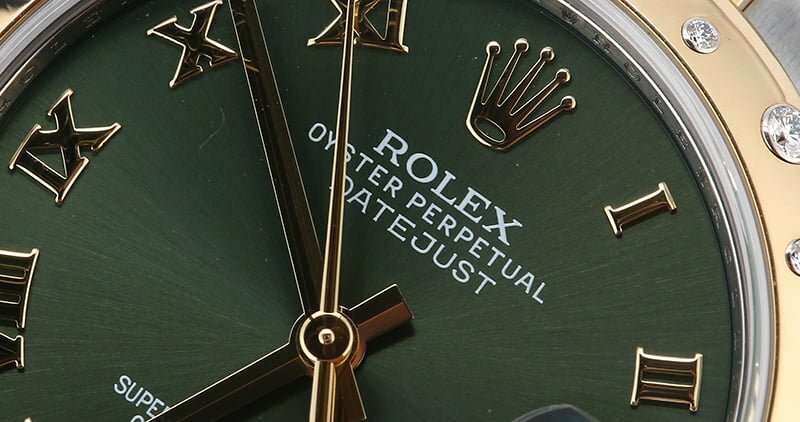 The color is also unique to Rolex, the watchmaker forges their dial colors on their own through a lengthy and expensive process to create these brilliant hues. We already touched on this diamond-clad bezel, but it’s worth taking a second look. The diamonds aren’t just perfectly aligned around the face, they’re placed in a scattered pattern, adding a touch of whimsy while remaining inherently elegant. We also love the size of this watch, which is characterized as mid-size for a Ladies Datejust at 31mm. At just a few millimeters bigger than the standard 28mm Ladies Rolex, the 31mm dial plays into this watches imposing looks but still doesn’t overpower the wrist. 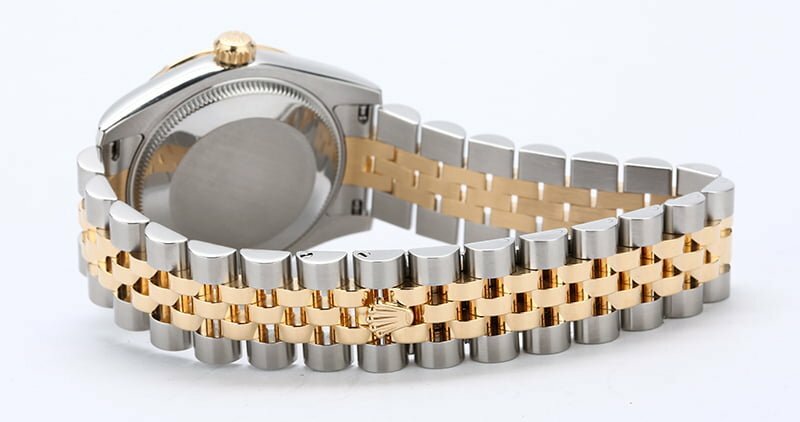 The bezel and bracelet itself are also both forged out of 904L stainless steel and 18k yellow gold. This combination will ensure this watch both holds its value and itself up against the test of time. Also, don’t forget to look at that striking Jubilee bracelet and hidden Crown-clasp, too. These small details add to both form and function of the timepiece, giving it a regal look. Of course, this Ladies Datejust is outfitted with the standard features like an Oyster case and screw-down crown that can withstand depths of 330 feet, a 2235 automatic movement, and scratch-resistant sapphire crystal. Being a DateJust, this timepiece also features the signature Cyclops date at three o’clock.